Chop the collards to be long and thin. 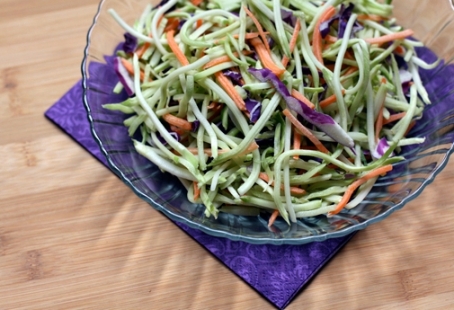 Add shredded cabbage and carrots. Blender garlic, ginger, coconut, honey, sesame oil, cayenne, lime juice, tahini and water. Taste and adjust seasonings. Pour over veggies and top with chopped cilantro, mint, basil, almonds and sesame seeds.